Relief. 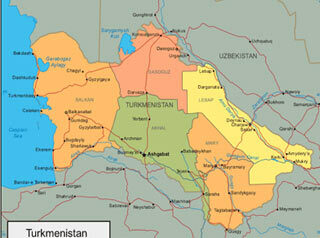 Turkmenistan is the plainest Republic of Central Asia. Almost 4/5 of its territory is within the Turan lowland occupied mainly by the Karakum desert. The Mountains Kopetdag (2942 meters above sea level) are situated in the southern part of the Republic. The two ridges Maly Balkhan (777 meters) and Bolshoi Balkhan (up to 1881 meters) are located in the north west of the country. The Foothill plain that joins the Prikaspisky lowland in the west joins the Kopetdag in the north. 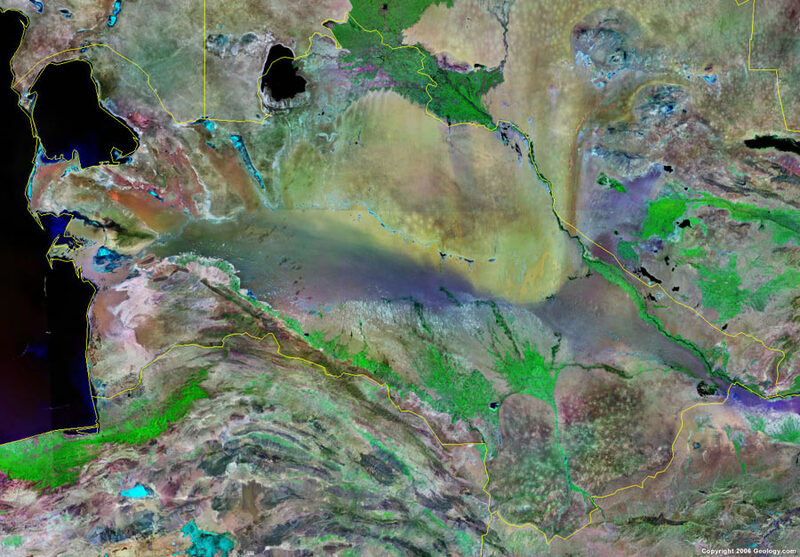 The river Murgab entering Turkmenistan in the southeast separates the northern foothills of the Paropamiz heights, the Badkhyz (up to 1267 m.) and Karabil (up to 984 m.). The highest peak of the Republic is a spur of the Gissar ridge (up to 3139 m.). Krasnovodskoe plateau (up to 308 m.) is situated in the western part of the country and on the southern outskirts of the plateau Ustyurt, in the northwest. The heights of Nebitdag (39 m.), Boyadag (134 m.), Kumdag, Mondjukuly (27 m.) and others are raised within the Prikaspian lowland. In the north and northeast from the foothills of Kopetdag lays Karakumy which are divided into the Central and Zaunguzsk. 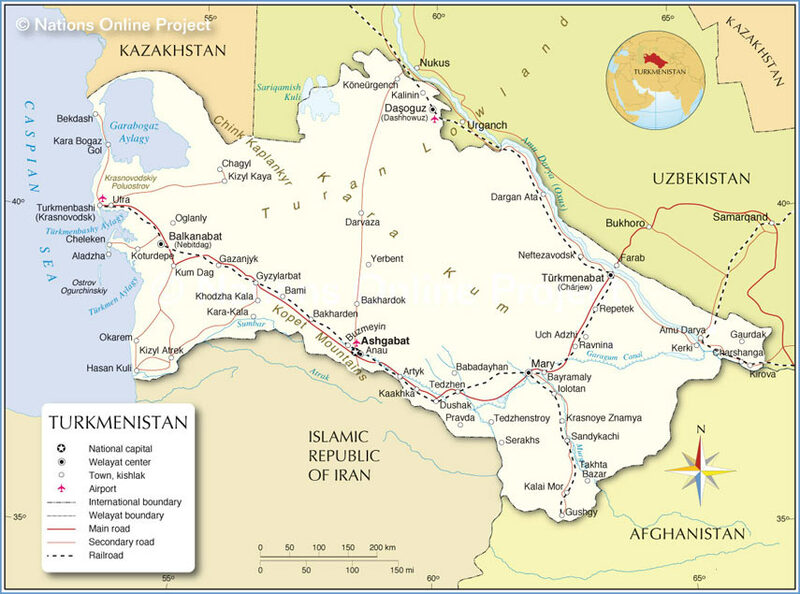 In between Amu-darya and Syr-darya there are southeastern Karakumy. Cellular-ridge and hilly sands are typical for these deserts. There are areas of barkhan sands and in the lowlands, takyrs and sors. 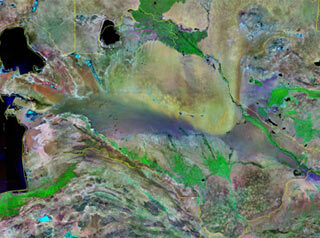 Small right side coastline of the Amu-darya enters into Turkmenistan. Climate. A long length of sunlight is typical for Turkmenistan: as an average in the east, the Center and south east of Karakumy it reaches 2800-3095 hours. In the north, an average year of sunlight constitutes 2940-2970 hours. The temperature on the plain territory of Turkmenistan varies considerably and has a sharp yearly course. The average yearly temperature in the whole territory varies from 11-13 degrees in the north to 15-18 degrees in the southeast. In the mountains, at an altitude of 1500-2000 m. it goes down to 7-10 degrees. The coldest month is January – its average temperature changes from –6 degrees in the northeast of the republic to +3 degrees in the southeast and +5 degrees at the edge in the southwest. Due to the intensive flow of the sun radiation and little clouds, the daytime temperature exceeds 40 degrees from May to September. A Continental climate is sharply expressed. Average yearly temperature amplitude reaches 30-34 degrees. 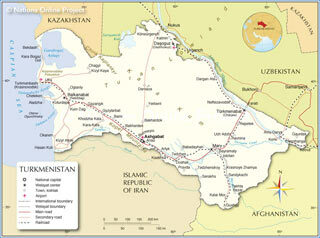 On the coast of the Caspian Sea it goes down to 26 degrees and in the oasis – to 28 degrees. In the mountains, at an altitude of 2000 m. it reduces to 22 degrees. 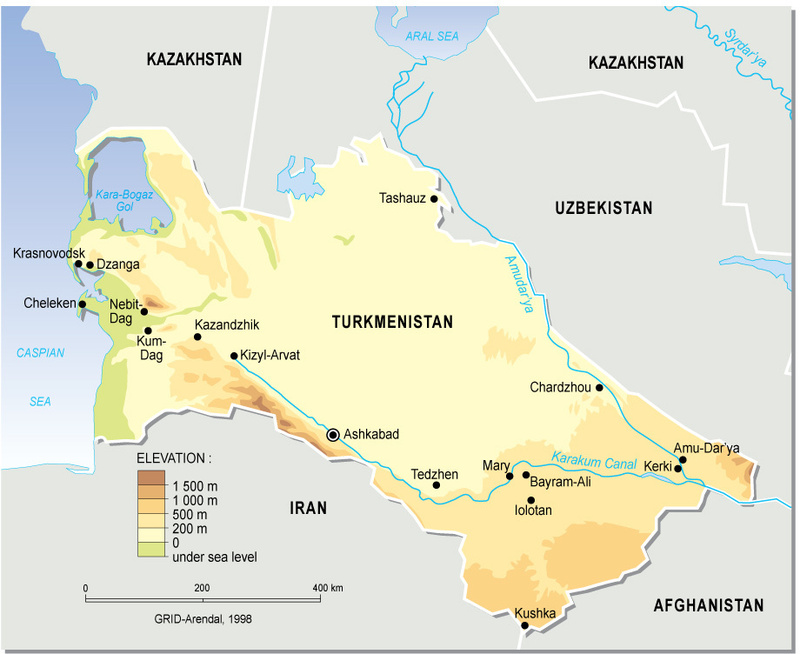 As an average, the precipitation in a year on the territory of Turkmenistan varies from 76mm (coast of the Kara-Bogaz-Gol bay) to 398 mm. (Kopetdag). The smallest quantity of precipitation noted is in the Zunguzsk Karakumy. During the coldest season the average quantity of precipitation varies from 43 mm in the northwest to 229 mm in the edge southeast (Kuitan). During the warm season it varies from 30 mm. in the east of Saunguzsk and Central Karakumy to 80 mm in the southwest and up to 150-200 mm in the mountains of Kopetdag. As an average for a year, the northeast winds prevail in the northern part of Turkmenistan, eastern winds prevail in the central part and along the foothill plain of Kopetdag and northerly winds prevail in the southeast Karakumy. The eastern winds mainly prevail on the Caspian Sea coastline in wintertime, during January. Water resources. 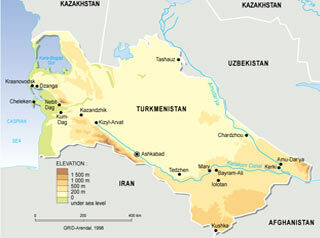 There is no regular surface flow on 80% of the territory of Turkmenistan. Rivers are only found in the south and eastern outlying areas of the country. The only river having a high water level is Amu-darya. In the south of the country the largest rivers are Murgab, Tedjen and Atrek. The majority of the lakes are salty. Yaskhan and Topiatan located in the Uzboya valley are the fresh water lakes. In the mountains there are the lakes of karst origin Kouata (in the Bakharden cave) and Khordjunly (in the Kugitangtau). Land resources. Grew and brown soils occupy the plateau Ustyurt, Krasnovodskoe and Zuanguzskoe. On the foothill plains light grey desert soil is widely spread. In the low mountain zone – typical grey desert soil; and in the high mountain zone – black grey desert soil. Brown soils are found at the highest parts of the mountain plateau and ridges of Kopetdag and Kugitangtau Mountains. In the considerable area of Karakumy consolidated (fixed) sands are widespread, alkali soil, takyrs and takyr type soils are found in the low lands. Flag is green field with a vertical red stripe near the hoist side, containing five carpet guls (designs used in producing rugs) stacked above two crossed olive branches similar to the olive branches on the UN flag; a white crescent moon and five white stars appear in the upper corner of the field just to the fly side of the red stripe. The state emblem of Turkmenistan is composed of three concentric circles divided by white stripes. On the outside, the emblem is framed by a purple stripe equal in width to the white stripes. The first circle is purple in color and contains images of open cotton boxes with green leaves and golden wheat ears. The wheat ears allude to the custom of greeting guests with bread and salt. A crescent moon and five five-pointed white stars are located in the upper portion of the circle. A white akhalteke horse, a breed indigenous to Turkmenistan and the pride of its people, graces the central blue circle.